March 1st; self Injury Awareness Day - Self-injury or self harming is when a person deliberately hurts themselves physically to deal with the emotional pain they are suffering. Take part for a short time on this awareness day and you might help someone stop forever. 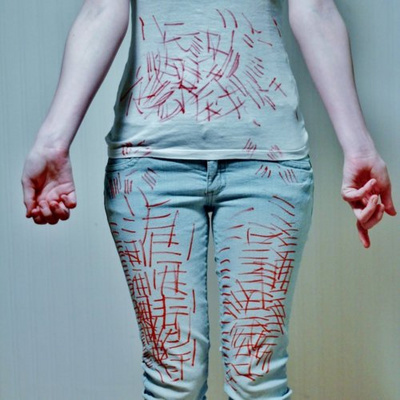 When it comes to self-harm cutting is thought of as the main way people hurt themselves. But burning, bruising and scratching are amongst other methods used by people who are distressed. Another misconception is that it's mainly teenage girls that use this coping mechanism - but it also includes people of both sexes and all ages, races and backgrounds. So why do it? This mechanism can provide people with a sensation that 'breaks feelings of numbness'. This emotional pain is caused by issues such as low-self esteem, trauma, perfectionism and abuse. A person can go on suffering like this while telling no-one and feeling unable to break the cycle. So how can you help solve the problem? Firstly print out a factsheet, depending on who you are and how you want to help. From parents and friends, to pamphlets for males and teachers, there is unique advice available for everyone. Hand these out, or pin them up and use the online templates to send letters off to radio shows or your local MP. For more information, go to the Self Injury Awareness Day website. Another small but significant thing you can do is buy one of the new orange and purple wristbands. You can't miss the colour, so when your friends ask what it's for you'll have the opportunity to talk about the day!